Yes, you may go ahead and lecture me now. 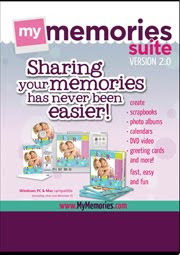 I forgot to announce the winner of the MyMemories digital software suite!!! I'm such a let-down! So, you have my apologies, and, without further ado, I will also provide you with the winner. Congratulations! Please e-mail me, and I will send your download code and instructions. You'll be doing some awesome digital scrapbooking in no time! Hooray! Thanks so much I cannot wait to see what I can make with fabulous new tool. Wahoo! !